(This review originally appeared at Outsider Writers Collective)“Stolen said this was a city of storytellers. That The City itself was a collection of stories and tales told and retold and retold. That The City was built on these tales just as it was built on concrete and steel, and sometimes these stories shifted like geological plates, shifted and rubbed, and the earth trembled, and The City, in kind, trembled. Without these tales, The City would just be a city, but this city folded itself within the other folds of stories and tales, and all the residents of this city were storytellers and soothsayers chanting nonsensical incantations, letting smoke drift from their mouths as they twirled and twisted, tight around their own worlds, the world around them into knots of “nots” and other words, so one never knew what to believe or not believe here” [pg 94:].Bliss Inc. opens on Nel Lowry’s transition from a small town in Ohio to The City, a stateless metropolitan collective that beacons to outsiders in the way any romanticized city might, stretching its magnetic characteristics into a dystopian commentary tinged with magical non-realities. Those familiar with the allure of Jose Saramago’s The Center from his novel, The Cave will immediately recognize The City’s irrational hold, as will any real-world citizen susceptible to the world’s intimidating cities, from Chicago to New York, London to Dublin. Bliss Inc. succeeds in allowing us to identify that irrational draw and perhaps better appreciate our own suburban and small town lives.Bliss Inc. is structured around the physical fluidity of The City. This is a place where buildings are “built so closely together that only several inches lay between them” (pg 23), and apartments contained “not one straight vertical wall,” and “didn’t look so much built or constructed as beaten into shape, a solid block of matter chipped away haphazardly to clear enough space” (pg 24). Citizens, perhaps because of their co-misery, are exceedingly friendly. Via a series of vignettes toward the middle of the book, we learn that living arrangements are a strangely haphazard affair. Nel nomadically moves from living in a perpetually flooded basement with a woman whose furniture is stationed on floating rafts, to a man whose face constantly morphs and changes, through twelve other situations before settling (and even then, not for long). These environments are depicted as a not-too-cloaked form of magical realist commentary on the absurdity of fighting to live in The City—any city—considering the inherent struggles.Nel’s motivation for following The City’s call is a job promise at a mega-corporation called Bliss Inc. The company exists as a micro-kindred to its surrounding strangeness, though “micro” may be misleading, as Bliss Inc. represents the idealized conglomerate, even being cited as the birth of contemporary capitalism. 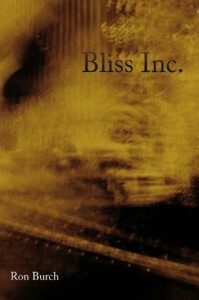 Nel’s primary motivation is securing a coveted “Lifetime Employment” position within Bliss Inc., and with this chase comes Bliss Inc.’s driving plot.Bliss Inc. beautifully teases the reader with resolution, from the opening description of arrival to the final page, and even then the reader is left with encouragement in lieu of conclusion. But it is because of this encouragement that Bliss Inc. should be on every reader’s bookshelf. Upon finishing, I knew I would forever look at cities, and my own suburban life, differently. Bliss Inc. is a truly phenomenal book, and I am comfortable with saying that it will easily make my top books of 2010 list, perhaps my top books of all time list.